4-Way locking with 7 - 1.5" steel live action locking bolts and 3 dead bolts for 10 locking points. Safe holds 60 firearms up to 56" tall, or 20/40/60 firearms and storage, or all storage. Door Storage, 7 Adjustable shelves, fully carpeted interior included, leatherette trim around barrel rest, and built in 110V electrical outlet. 4-Way locking with 9 - 1.5" steel live action locking bolts and 3 dead bolts for 12 locking points. 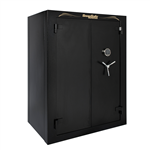 Safe holds 60 firearms up to 69" tall, or 20/40/60 firearms and storage, or all storage. Door Storage, 8 Adjustable shelves, fully carpeted interior included, leatherette trim around barrel rest, and built in 110V electrical outlet. Fire resistant for 60 minutes up to 2300° F (Tested and verified by a third-party independent lab), Internal fire panel are made of magnesium oxide. Modular design, easy to assemble, move anywhere piece by piece. Great for walk-in closet or upstairs. Thick 9 gauge 2 ply steel exterior wall. Sledgehammer and pry-bar resistant 3/16" solid steel door. 14 x 1" steel live action locking bolts and 2 x non-breech seal on hinge sides. Safe holds 56 + long guns up to 53.5" tall, heavy duty interior. Lifetime Warranty against Burglary and Fire Damage.